With the advent of the web and greater ease of communication between people all around the world, it comes as not surprise that we can see products from other countries that as yet, are not available in our own. This is the case with these Diamond abrasives sold by Bruce Hoover at the Sanding Glove in the USA. Made by 3M, I spotted two types of loop-backed abrasives which will fit on your power sanding arbors - something we turners can embrace and make excellent use of when flattening inlayed metals, stones, shell, ceramics and so on. This is the first time that products specifically designed to deal with these materials have been available to hobbyists, and in small quantities. One is a "coarse" flexible diamond disc available in either 50mm (2in) or 75mm (3in) diameter, which can be used to level down the materials to remove lumps and bumps. Quite simply, they are micron-graded diamonds that are metal-bonded in nickel to form 'islands' on the disc surface. 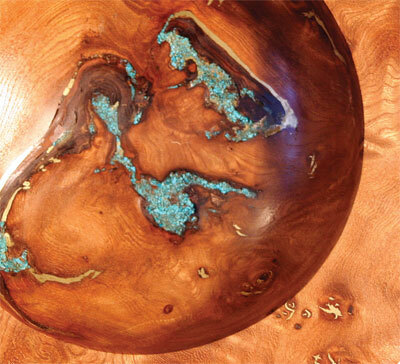 The islands are resin-bonded to a strong flexible backing in an open dot pattern. and are designed for fast finishing on stone inlay, glass, ceramics, non-ferrous metal, etc. They also claim to have a long life. The disc produces a very aggressive cut but does produce a consistent scratch pattern. Depending on the material, it will cut better and last longer if used with a little water - or at least dampened during use. If it clogs, wash it clean with water or use a toothbrush to clean off any residues. 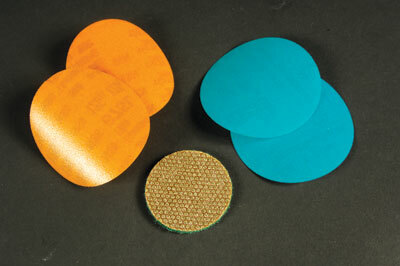 To refine the surface once all the humps and bumps are removed, use the 3M Diamond Microfinishing Film. These are micron-graded Diamond mineral, electrostatically coated and resin bonded to a 5mil polyester film backing. They are designed for a fast finish reduction on hard materials including stone inlay, glass, ceramics, non-ferrous metal, granite and others. These discs leave a very consistent scratch pattern and again can be used wet or dry. Simply wash them to clean. They are available in 50mm (2in) or 75mm (3in) diameters and the grit grades available are 125 Micron (120 grit equivalent), 74 Micron (220 grit equivalent) and 45 Micron (320 grit equivalent). These are nicely colour coded as well. These products are fantastic to use. The stone I used to try them out was easy to work with and I was able to produce a quicker and cleaner result than when using the equivalent aluminium products. These are a must-try item for those working with alternative-material inlays. You will not be disappointed! "These are a must-try item for those working with alternative-material inlays"